On 8th November, Chinese Ambassador Jin Zhijian was invited to attend the launching ceremony of Alipay in Iceland and delivered a speech. In his speech, Ambassador Jin warmly congratulated successful launch of Alipay in Iceland and expressed his sincere thanks to all the parties concerned to make it happen. Ambassador Jin also pointed out that non-cash mobile payment such as Alipay has become a common way of payment in the daily life and travel consumption of the Chinese people, and it is gaining more popularity. 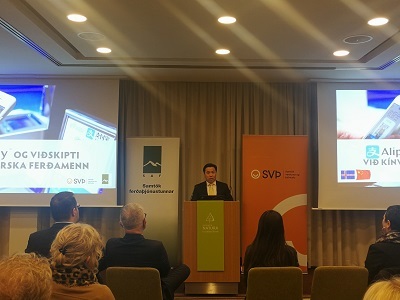 With the number of overseas Chinese tourists increasing year by year, especially considering the sound development prospect of the Chinese tourist market with Iceland as a destination, it is very necessary and good time for Alipay to promote its use in Iceland, which will not only greatly facilitate travel consumption of Chinese tourists in Iceland, enrich their service experience, enhance attraction of Iceland to Chinese tourists, promote Islandic tourism development, but also help companies from both countries cooperate in e-commerce field. Therefore, it is hopeful that more and more Icelandic companies will introduce mobile payments such as Alipay in their business. It is understood that with the strong support of ePassi, ISAVIA, Federation of Iceland Trade and Services, Iceland Travel Association and others, more than 50 Icelandic enterprises have already used Alipay payment service, and achieved good result. More companies are expected to use Alipay payment in the future. Mr. Chen Guisheng, Head of Economic and Commercial Office of the Chinese Embassy, and more than 150 representatives from local tourism, hotel, catering and other related industries participated in the event.